These are stem cells taken from the embryo of a mouse. The color is the result of a stain used to make them easier to see. The embryo had to be killed to get the cells, but they can develop into almost any kind of mouse cell (skin, nerve, muscle, etc.). Every once in a while, I run across a story in the scientific literature that seems just too good to be true. Such was the case when I was reading the February 22nd issue of Science News. In a story entitled “A little acid can make a cell stemlike,”1 the author reported on some amazing results that were published in the journal Nature. In the published studies, scientists from the RIKEN Center for Developmental Biology in Kobe, Japan claimed that they could take cells from various parts of a mouse (like the brain, skin, and liver) and transform them into stem cells by simply treating them with acid or other external stimuli! This would be an amazing feat, because stem cells are able to develop into many different kinds of cells. Consider, for example, what happens when two mice successfully mate. The sperm from the male fertilizes the egg from the female, and the result is a single cell that will eventually develop into a new mouse. In order for that to happen, the cell begins making copies of itself. As more and more copies are made, the individual copies begin to start “specializing” so they can do specific tasks. Some develop into skin cells, others develop into nerve cells, others develop into blood cells, etc. This process of cells specializing into different types of cells is called differentiation. Of course, the cells in the developing mouse don’t start differentiating right away. There has to be a group of cells that have the ability to produce all the different kinds of cells the mouse needs, and these cells are generally called embryonic stem cells. 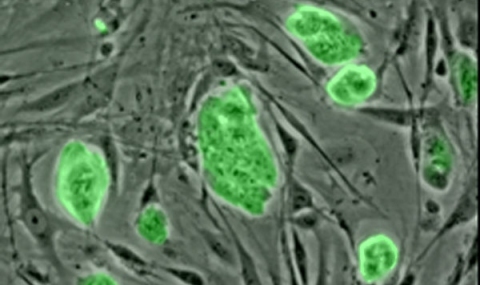 Examples of mouse embryonic stem cells are shown in the image above. They may look unassuming, but they are truly amazing, because they can produce any kind of cell that the mouse needs. Of course, in order to produce that image, the mouse embryo from which the cells came had to be destroyed. In other words, to get mouse embryonic stem cells, you have to kill the mouse whose cells you want. If you want human embryonic stem cells, you have to kill the developing baby whose cells you want. This, of course, presents a problem. Embryonic stem cells have great potential when it comes to solving many medical issues. Suppose, for example, you have a heart attack. As a result, some of the cells that make up your heart muscle died. In most cases, the body can’t completely replace the cells that are killed, so you will probably have a weaker heart for the rest of your life. If stem cells could be used, perhaps they could differentiate into heart muscle cells and completely repair the damage to your heart. Of course, if you want to use embryonic stem cells for such a treatment, you will have to kill a developing baby in order to get those cells, and while some don’t see this as a problem, many (including myself) do. There is, however, another option. Even as an adult, you have some stem cells in your body. For example, you have stem cells in your bone marrow that are able to differentiate into a lot of different types of blood cells. While they are not able to become any type of cell you want, they can differentiate into a few different types of cells. To distinguish between these kinds of stem cells and the stem cells that come from embryos, scientists often use the terms pluripotent and multipotent. Pluripotent stem cells can differentiate into just about any type of cell the body needs. Multipotent stem cells, on the other hand, can only differentiate into a few specific types of cells. Obviously, pluripotent stem cells offer more possibilities, because they can differentiate into a wider range of cell types. Of course, if you have to kill a developing baby to get such cells, most people (including myself) would never accept the treatment. This is why the research I read about in Science News seemed so wonderful. In two separate papers,2-3 the researchers claimed that they could turn liver cells, brain cells, fat cells, etc. back into pluripotent stem cells. This has been done before, but the process requires manipulating the genetics of the cell itself, usually with the help of a virus. The resulting stem cells seem to have some problems, which could be related to the method by which they are produced. I considered blogging about it myself, but I decided to wait, because the results seemed just too good to be true. Well, it turns out that they probably were. As scientists began to question different aspects of the two papers, the RIKEN Center for Developmental Biology launched an investigation. Just yesterday, I saw a report that discusses the results of the investigation. The investigating committee has determined that the lead author engaged in misconduct. While this doesn’t demonstrate that the results themselves are fraudulent, it does cast a very negative light on the papers. This is, of course, unfortunate. Pluripotent stem cells hold lots of promise for treating different medical problems, but getting them from embryos is simply immoral. As a result, trying to get cells that can be extracted from adults to become pluripotent stem cells is a laudable goal. Some progress has been made in this area, but there is still a long way to go. Perhaps someone will be able to replicate the Japanese team’s procedure, but that remains to be seen. Until then, the only ethical option that remains is to use the multipotent cells that can already be found in adults. There have been great advances in that area, and I suspect there will be more as time goes on. As usual, your article brings complex ideas into clear focus. I’ve noticed the best commentators always wait a while before reacting to breaking news, it seems there’s a lot of fact checking to do first! I’ve got one question: what are the limitations of the current Induced Pluripotent Stemcells that are inspiring research into this ongoing research? Are they all dependent on viruses to be induced? Thanks for your question, Cheri. When embryonic stem cells are compared to induced pluripotent stem cells, the latter tend to die of more quickly and produce structures that age more quickly. There have been some researchers who have produced induced pluripotent stem cells without viruses. However, I am not aware of any published studies that have shown how they compare to embryonic stem cells. Really Generous Bacteria! The More We Learn About Bone, The More Amazing It Is!